Need Artwork For Your Home Or Office? Bumblejax Has You Covered! Are you looking for gallery quality art for your home or office? Whether you’re an interior designer or designing a space for yourself in a home or corporate office, we can create beautiful wall art for you using unique materials such acrylic (blocks too! ), bamboo , birch, canvas and raw aluminum. Every piece is handcrafted locally here in Seattle and shipped worldwide. We print any digital image to high-grade photo paper then mount it to our unique materials for a modern, high-end look. You can use your own images as many do to personalize the space or choose from our collection of over 50 million high quality images. Here are your options with us. NOTE: This is just the first phase of our gallery launch. In the future, we’ll be integrating the gallery better so you can save photos to your account and order online. For now, you’ll just send us the Photo ID of the photo you’re interested in (details below). We’ll be featuring some independent artists in the future as well! When you click in the category search tab you’ll see all the photos offered. 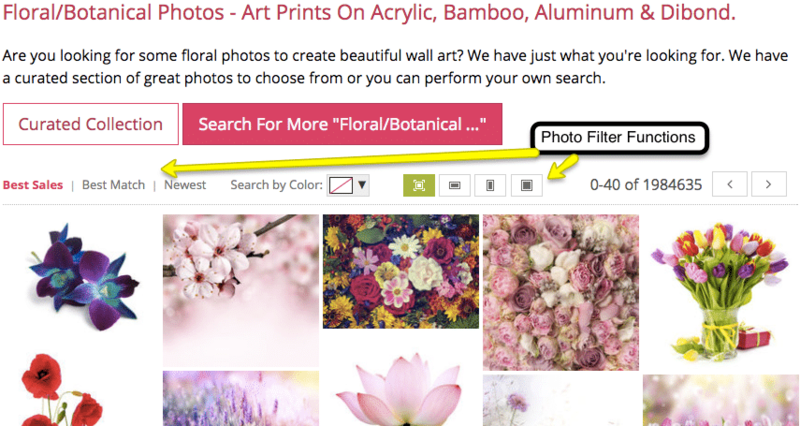 This example shows the Floral/Botanical category search and you can see there are a few filters to help you find what you’re looking for. The default filter is Best Sales which are sales across the network of our photos provider and not necessarily best sales here at Bumblejax. It’s just a starting point. You can filter these photos by Color and Orientation as well. Another great way to locate photos in the style you prefer is to click on the photo to open up the lightbox of the larger image. You’ll then see a list of similar photos on the right side as shown in the image below. If you see a photo you would like to purchase simply send us the Photo ID. We can take a look to make sure it will print at high quality for the print size that you need. Almost all photos in the gallery will print well up to about 40-50″. Just let us know what type of mounting you want for the photo and the size and we can get some pricing for you. The price for the photo license is between $10-$60 and varies depending on the size of the print. 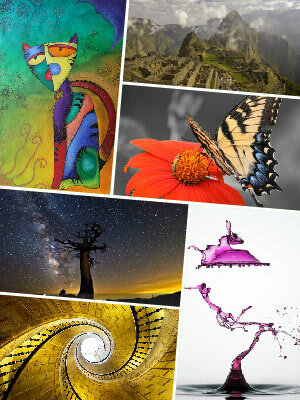 This is a much smaller curated gallery of high quality digital art, paintings and photography from independent artists. 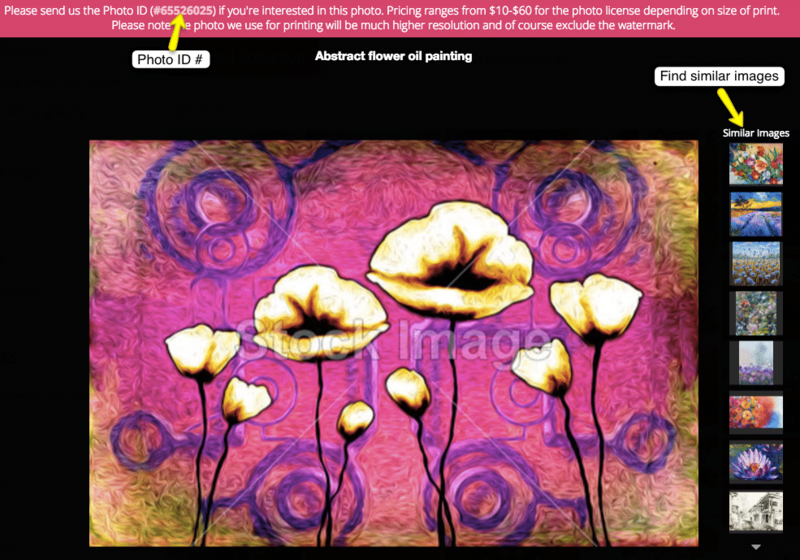 Search for images at www.artprintstopia.com and if you see something you like pass along the URL of the image. We have far more options with sizes and product options than what is available for ordering there so it’s best to just contact us with the images you want. Simply just send us the URL(s) of the page for that image. Pricing really varies by artist since they set the pricing. We can typically negotiate a better deal than what is currently listed. This is another reason to just contact us with what you need rather than ordering off the site. 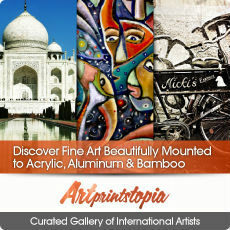 Search for cool art at ArtPrintstopia here. If you are having trouble locating a particular style or subject for your art, not sure of the best paper type or product, please let us know and we’re happy to help you select the right photos and right products for your design project! If you already have your own images ready to go you use our easy online upload and configuration system to order your art! Questions or comments? Please contact us here.